Did you know that you don’t need a medical background to volunteer at The Free Clinics? In addition to our clinical volunteers, many opportunities exist for volunteers with skills as varied as front desk reception, building maintenance, Spanish interpreting, gardening, bicycle repair, and more! Join us for coffee and tea to learn more about available volunteer opportunities at The Free Clinics! 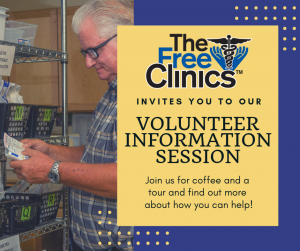 We will present a brief overview of all of the positions and duties that need volunteer assistance to keep The Free Clinics operational, and take you on a short tour of our facility. The Free Clinics would not be able to continue in our mission of providing access to quality healthcare to our neighbors in need without volunteers like you. Now is a great time to find out how you can help! For more information email volunteer@thefreeclinics.org or visit https://www.thefreeclinics.org/volunteer/. Administrative, clinical, case management, and prescription assistance staff are available to assist patients during regular business hours. 1st & 3rd Tuesdays at 5:00pm. Accepts walk-in patients and appointments. Other clinical services are by appointment only.